We investigated two methods to promote prospective teachers’ awareness of learner diversity and application of teaching principles using a problem-based learning environment. In Experiment 1, we examined the effects of presenting a conceptual framework about learners’ individual and group differences either before or after instruction on teaching principles. In Experiment 2, we examined the effects of signaling issues of diversity within a set of worked-out classroom cases that were presented in either text or animated format. Learning was measured with a problem-solving transfer test and learning perceptions were measured with program-rating questionnaires. The findings showed a learning advantage for early instruction on individual and group differences in the classroom and participants who learned teaching principles with diversity instruction gave more favorable program ratings than those who did not. Case format did not affect students’ learning or perceptions about learning but signaling diversity issues within worked-out classroom cases promoted students’ transfer of teaching principles to diverse virtual classrooms and reduced perceived cognitive load. Moreno, R. & Abercrombie, S. (2010). Promoting Awareness of Learner Diversity in Prospective Teachers: Signaling Individual and Group Differences within Virtual Classroom Cases. 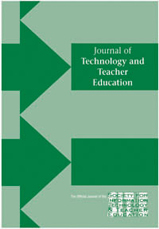 Journal of Technology and Teacher Education, 18 (1), 111-130. Waynesville, NC USA: Society for Information Technology & Teacher Education. Retrieved April 18, 2019 from https://www.learntechlib.org/primary/p/29271/. American association of State colleges and Universities (1999). A call for teacher education reform: A report of the AASCU taskforce on teacher education. Washington Dc: author. Ausubel, D. P. (1960). The use of advance organizers in the learning and retention of meaningful verbal material. Journal of Educational Psychology, 51(5), 267-272. Autodesk. (2003). 3D Studio Max (version 5) [computer software]. Educational version. San Rafael, ca: author. Block, K. K. (1996). The case method in modern educational psychology texts. Teaching & Teacher Education, 12(5), 483-500. Calandra, B., & Barron, A. E. (2005). A preliminary investigation of advance organizers for a complex educational website. Journal of Educational Multimedia and Hypermedia, 14, 5-23. Eggen, P. & Kauchak, D. (2006). Educational psychology: Windows on classrooms (7th ed.). Upper Saddle River, nJ: Prentice-Hall. Ginns P. (2005). Meta-analysis of the modality effect. Learning and Instruction, 15, 313-331. Greenwood, G. E., Fillmer, H. T., & Parkay, F. W. (2002). Educational psychology cases (2nd. Edition). Upper Saddle River, nJ: Merrill/Prentice-Hall. Harp, S. H., & Mayer, R. E. (1998). How do seductive details do their damage: a theory of cognitive interest in science learning. Journal of Educational Psychology, 90, 414–434. Hmelo-Silver, C. E. (2006). Problem-based learning: What and how do students learn? Educational Psychology Review, 16, 235-266. Hmelo-Silver, C. E., Derry, S. J., Woods, D., Del Marcelle, M., & Chernobilsky, E. (2005). From parallel play to meshed interaction: The evolution of the eSTeP system. In D. Suthers, T. Koschmann, & T.W. Chan (eds. ), Proceedings of CSCL 2005. Mahwah, nJ: erlbaum. Jackson, D. L., & Ormrod, J. E. (1998). Case studies: Applying educational psychology. Upper Saddle River, nJ: Prentice-Hall. Kettanurak, V. N., Ramamurthy, K., & Haseman, D. (2001). User attitude as a mediator of learning performance improvement in an interactive multimedia environment: an empirical investigation of the degree of interactivity and learning styles. International Journal of Human-Computer Studies, 54, 541-583. Lowe, R. K. (2003). Animation and learning: Selective processing of information in dynamic graphics. Learning and Instruction. 13, 157-176. Macromedia. (2001). SoundForge [computer software]. San Francisco: author. Macromedia. (2002). Flash MX™ [computer software]. San Francisco: author. Mautone, P. D., & Mayer, R. E. (2001). Signaling as a cognitive guide in multimedia learning. Journal of Educational Psychology, 93, 377-389. Mayer, R. E. (1979). Can advance organizers influence meaningful learning? Review of Educational Research, 4(2), 321-383. McFalls, E., & Cobb-Roberts, D. (2001). Reducing resistance to diversity through cognitive dissonance instruction: implications for teacher education. Journal of Teacher Education, 52(2, March-april), 164-172. McMinn, P. M. (2001). Preparing the way for student cognitive development. Multicultural Education, 9(1), 13-15. McVee, M. B., Dunsmore, K., & Gavelek, J. R. (2005). Schema theory revisited. Review of Educational Research, 75, 531-566. Moreno, R. (2004). Decreasing cognitive load for novice students: effects of explanatory versus corrective feedback on discovery-based multimedia. Instructional Science, 32, 99-113. Moreno, R. (2007). Optimizing learning from animations by minimizing cognitive load: cognitive and affective consequences of signaling and segmentation methods. Applied Cognitive Psychology, 21, 765-781. Moreno, R., & Livne, N. (2006, april). Using an empirically-based taxonomy of diversity factors to improve prospective teachers’ problem solving. Paper presented at the 2006 annual meeting of the american educational Research association (aeRa), San Francisco, ca. Moreno, R., & Mayer, R. E. (2007). Interactive multimodal learning environments. Educational Psychology Review, 19, 309-326. Moreno, R. & Ortegano-Layne, L. (2007). Using cases as thinking tools in teacher education: The role of presentation format. Educational Technology Research and Development, 56, 449-465. Moreno, R. & Valdez, A. (2007). Immediate and delayed learning effects of presenting classroom cases in teacher education: are video cases or case narratives more effective? Journal of Educational Psychology, 99, 194-206. Nagarajan, A., & Hmelo-Silver, C. E. (2006). Scaffolding learning from contrasting video cases. In Proceedings of the 7th International Conference on Learning Sciences (pp. 495-501). Bloomington, in: international Society of the Learning Sciences. Quilici, J. L., & Mayer, R. E. (1996). Role of examples in how students learn to categorize statistics word problems. Journal of Educational Psychology, 88, 144-161. U.S. Department of education. National center for educational Statistics (1999). Teacher quality: A report on the preparation and qualifications of public school teachers (nceS Publication no. 1999080). Washington Dc: U.S. Government Printing office.